Renewable-based power systems that have zero or low carbon emissions require on-demand energy storage like lithium-ion batteries. But, the degradation of these batteries is a major concern operationally and economically. In a new paper, "An intertemporal decision framework for electrochemical energy storage management," published in Nature Energy, Carnegie Mellon University and Tsinghua University researchers propose a new framework that addresses the degradation of lithium-ion batteries—also known as electrochemical energy storage (EES). They do this by deriving, implementing and optimizing new metrics. Carnegie Mellon researchers Guannan He, Panayiotis Moutis, Soummya Kar and Jay Whitacre, collaborated with Qixin Chen from Tsinghua University. The work was conducted, in part, at CMU's Wilton E. Scott Institute for Energy Innovation. "The costs of lithium-ion batteries have fallen drastically in recent years. These batteries, especially those that are low cost, degrade with use and are now being contemplated for use in very large grid-tied energy storage installations," said Whitacre, the Trustee Professor in Energy in the College of Engineering and director of the Scott Institute. "A refined planning and operational decision-making tool that properly valuates and addresses battery break down as a function of use over many years is needed to derive optimal economic benefit from the system." "Developing a comprehensive and rigorous approach that optimally valuates and manages EES degradation over different decision horizons is imperative to mitigate the risk of value loss from inappropriate consideration for EES degradation," said He, a Ph.D. student in the Department of Engineering and Public Policy. The authors present two metrics for battery operating and planning decisions: the marginal benefit of usage and the average benefit of usage. 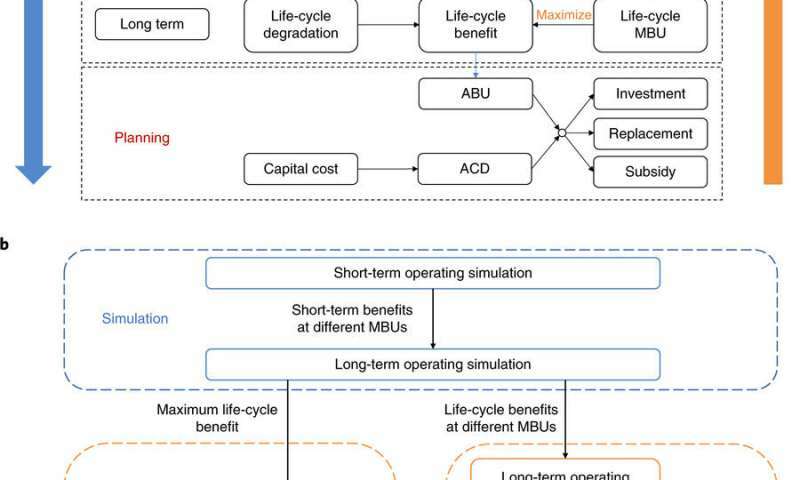 The marginal benefit of usage brings long-term information to short-term decisions and is proved in the paper to allow for the maximization of the life-cycle benefit when short-term decisions are made. The researchers conducted two case studies, which reported that the proposed framework can improve the life-cycle value of EES by over 30 percent compared to the common battery dispatch methodology used widely.